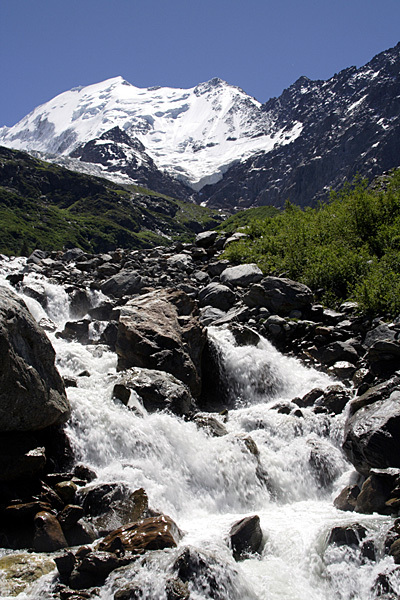 Meltwater pours from the Glacier de Bionnassay on the flank of Mont Blanc. The Col de Chavière is crossed by the GR55 and is the highest point on the route. 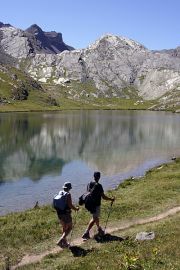 Walkers pass the Lac de Lauzanier on the way to the Pas de la Cavale. 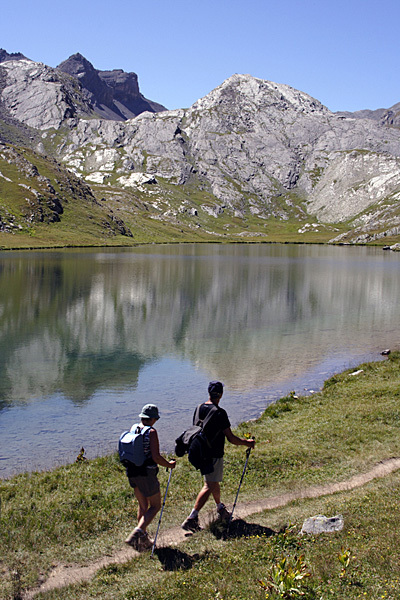 The GR5 is a classic traverse of the French Alps from Lac Leman (Lake Geneva) to Nice on the shores of the Mediterranean. 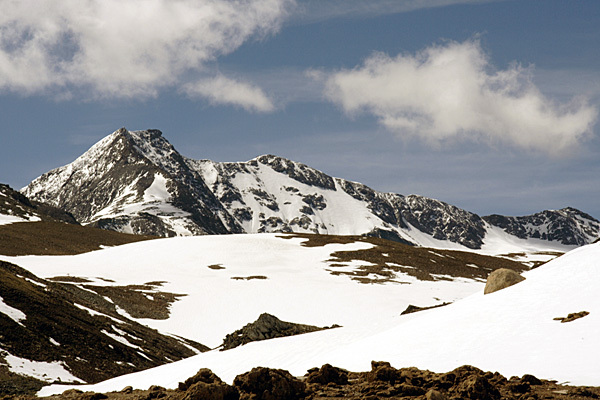 Surprisingly, considering the nature of the terrain, the route can be covered by most fit and active long-distance walkers without undue difficulty. When accepting this project, a comment was made that the route "would benefit from being walked twice." This was interpreted as an opportunity to walk it twice in a single trip, prolonging the enjoyment! The GR5 has two separate starting points and two separate finishing points, as well as numerous variant and alternative routes along its course. Some variants last for as long as five days and could be considered as self-contained long-distance walks in their own right. The plan was to walk the GR5 from North to South, checking all the variants and alternatives along the way, taking note of all the useful services that walkers like to know about in advance of reaching them. On all but a handful of days, the sun shone gloriously from clear blue skies. Conditions were ideal for checking such a mountainous trail. Once the Mediterranean was reached, a new pair of shoes were collected from a post office, a worn-out pair of shoes were discarded, and the GR5 was walked all the way from South to North to finish back on the shore of Lac Leman. The new guidebook was written entirely on the hoof in the Alps, while walking over 1600 kilometres (1000 miles) in 10 weeks. The completed manuscript, with words, pictures, maps and route profiles was delivered for publication two weeks after returning home. The route research for the second edition of the guidebook was completed by Cicerone directors Jonathan and Lesley Williams, who walked the whole of the GR5, while I checked the variant GR52 through the Mercantour National Park. The second edition contains text changes, photo changes and map changes, and the third edition keeps everything fully up-to-date.